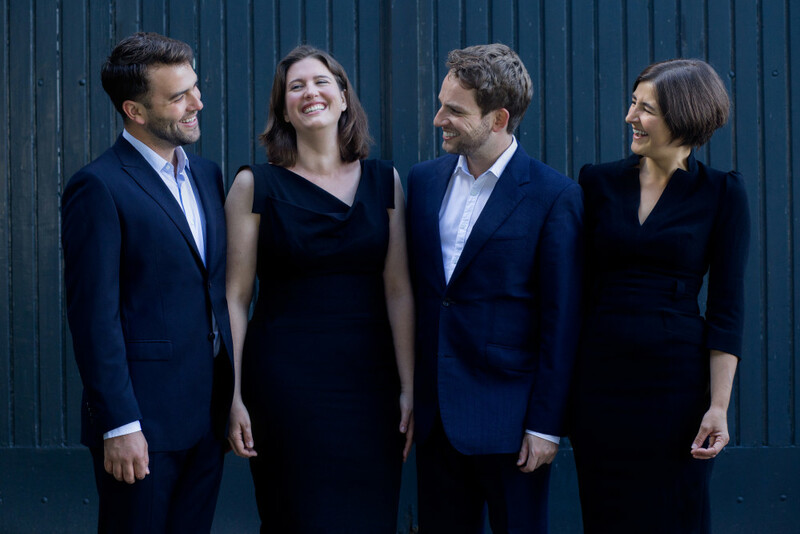 Damask Vocal Quartet gives deeply-felt, finely-honed performances of Romantic and contemporary repertoire in Europe and North America. Hoera!! Damask Vocal Quartet - Damask Debut CD is geslaagd! Dankzij 199 donaties die samen € 10.513 opleverden voor Damask Vocal Quartet. Damask Vocal Quartet is making its first album! 7 Mountain Records will release the disc of Brahms and contemporaries in fall 2018. Damask Vocal Quartet is making its first album: O Schöne Nacht! Katharine, Marine, Guy, and Drew, along with French pianist Flore Merlin, are finally releasing our debut recording on the Dutch label 7 Mountain Records. 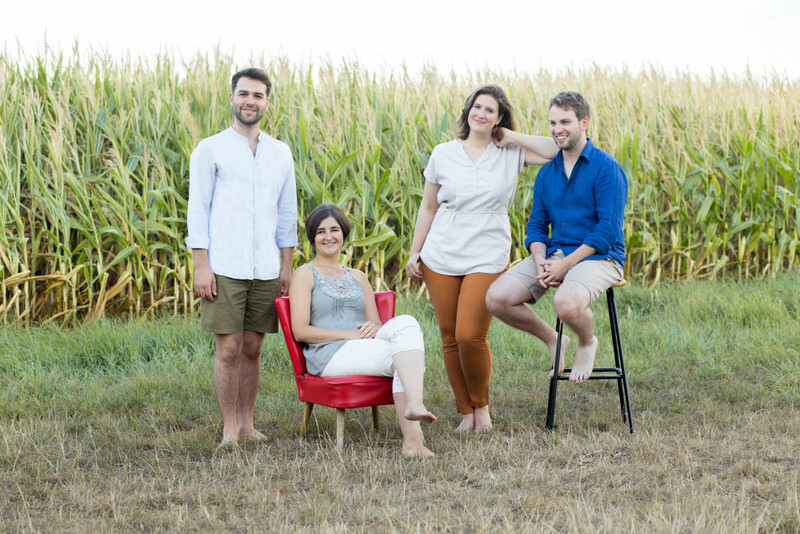 Damask is four singers: American-Dutch soprano Katharine Dain, French mezzo Marine Fribourg, English tenor Guy Cutting, and Canadian baritone Drew Santini. We have become known for our particular beauty of sound and positive energy in performance: "The four voices were sublimely intertwined, each with their own character ... extreme control over sound and effects ... their musical language is exciting, happy, entertaining, and sometimes tongue-in-cheek towards tradition" (Lia de Vries). The CD gathers favorite Romantic quartets and piano pieces themed around night, in all its mystery, splendor, and sensual possibility: Johannes Brahms's complete cycles Op. 31, 92, and 112 and quartets of two of his lesser-known contemporaries, Heinrich Herzogenberg and Gustav Jenner. It also contains the premiere recordings of a set of piano pieces by Theodor Kirchner, a friend of Brahms. WHY SHOULD I SUPPORT THE CD? I'VE HEARD DAMASK IN CONCERT. WHAT MAKES THIS RECORDING SO SPECIAL? This process has allowed us to refine and explore our music-making further than ever before. The music is lush, dramatic, contemplative, joyful, and full of longing, a perfect fit for our quartet's sound; when you hear the result, we think you'll hear an intimacy, a level of risk and drama and beauty that is unique to this recording. And you'll be able to listen forever. We chose a very special piano to record on: an 1868 original J. B. Streicher. Brahms owned a Streicher and performed and composed for this instrument's transparency of sound and dramatic range of color. We feel very lucky to have found this instrument from the same time and maker, which brings us closer to Brahms's own sound world than we thought possible, and to have been granted special permission to use it--this piano has only been recorded once before by its owner. As you can see, O Schöne Nacht is a massive project--one we waited to undertake until we were sure that the music and the moment were perfect. We can't wait for you to hear the album, but we need your help to get to the finish line! Please join us and be a part of our biggest labor of love yet, and you'll enjoy the results for years to come. I am happy to support these wonderful artists!! These people are amazing - they sing beautifully and keep an amazing spirit of collaboration and generosity alive through their music! Sending love and support for all that you do! Can't wait to hear the CD! Glad to help, looking forward to your album! Geweldig ensemble dat ik heel veel succes gun. Drew and Company -- Congratulations! You're doing an amazing job. I see this as payment for being a big inspiration! Good luck! en 115 andere donaties zonder motivatie.